Find all known locations o/t Great Wall and Follow its Pathway from Dandong and the Yalu River at the Liaoning Province Eastern Border around Shenyang to Qinghuangdao and Shanhai Pass on the Bohai Sea Coast. Then from the Eastern Bohai Sea to Beijing, from Shanxi Province to Shaanxi Province, and then via Ningxia Hui Autonomous Region and the Gobi Desert of Inner Mongolia to wind up in Gansu Province in the far west of China, near Dunhuang at the edge of the Taklamakan Desert. Apart from this main pathway, additional sections are identified within Qinghai Province and in Inner-Mongolia AR. Outer Defensive Layer locations, Inner Defensive Layer locations and supporting Fortresses are included in this List where possible ! Some locations may have disappeared or remain unfindable on Google Earth Maps. The Great Wall of China was built in different historical periods. The exact length of the Great Wall of China as was constructed during the Ming Dynasty (1368 AD - 1644 AD) was determined to be 8,851.8 km in December 2008, as announced by a national survey team. Return to Great Wall of China Satellite Map - Click Here !! According to some sources and source maps (Lonely Planet, 8th Edition (2002), Lonely Planet Publications Pty Sydney, Australia) an outer defensive layer of the Great Wall of China extends through Hebei Province above Zhangjiakou and just South of Kangbao Town, to continue through Inner-Mongolia Autonomous Region and ends somewhere at quite a distance North-East of Hohhot in the Gobi Desert. 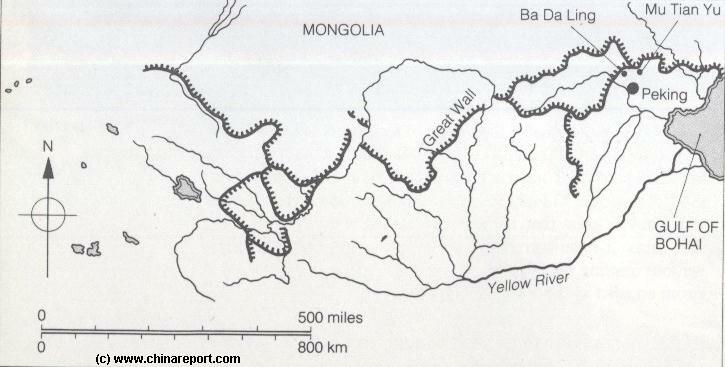 The exact location and pathway of this Great Wall of China layer in Inner Mongolia is under research by China Report Staff (March 2009 AD). So far it is established that the eastern most section of this length of Great Wall starts somewhere near or at the Shandian River in Inner Mongolia AR, which lies just across the Northern-Central Border of Hebei Province. From there it passes around and south of Baochang Town. Due South-East of lies Paotai Yingzi, at the foothills of the Damagun Shan Mountain and the location of another visible and visitable Great Wall location (China Report is trying to confirm the existence of this location + coordinates via Google Maps and other sources). Next it continues westward to cross the Hebei Province Border and pass underneath Kangbao Town in Hebei Province. From Here the Great Wall winds away to cross back into Inner-Mongolian Territory staying well North of Shangdu and Dailu Hao towns (See Most Detailed Map - Hebei Province Map 1 Schematic). As recently as 1998 AD archaeologists working in Xinjiang-Uygur Autonomous Region found a wall that ran from Yumen Pass (Jade Gate) near Dunhuang in Gansu to the northern edge of Lop Nur, skirting one of the trajectories of the Silk Road. As with other sections of the Great Wall in the far west including the Yumen Wall remnants, these were earthen ramparts made of rammed yellow sandy soil and jarrah branches. There is little or no doubt that this is part of the Great Wall - most likely dating to the Han Dynasty Era (206 BC - 220 AD), as it comprises a complete defensive network encompassing the flowbed of the Shule River with within the Oasis that served as the water sources for Han Chinese Military encampments which are known to have existed at this early time in this particular sector. This new discovery was dubbed Han Changcheng (Han Dynasty Great Wall) and it extended the length of the Great Wall by 500 km, to bring the wall to a length of 7,200 kilometers. Apart from the Eastern Section and Outer Layer in Liaoning Province, a Seperate but linked Great Wall of China - the main body of the Wall - starts in Hebei Province at Qinhuangdao, to wind its way westward from there. The initial part of the Great Wall at the Bohai Sea is Laolongtou, the Old Dragon′s Head. According to the latest Report in December 2009 AD, previously unknown sections of the Great Wall of China have been unearthed and discovered in Tonghua County of South-Eastern Jilin Province - near the Yalu River. So far 11 possible sections of ruins of the Great Wall dating to the Qin Dynasty (221 BC - 207 BC) and Han Dynasty (206 BC - 220 AD) Era's were identified in Jilin Province, with four of them confirmed (so far). Satellite image of China and North-East Asia, with super-imposed schematic Map of the location and Path of the Great Wall as constructed during the Reign of the Ming Dynasty. Included for reference are City names, geographical features of landscape, Names and locations of Passes on the Great Wall of China. 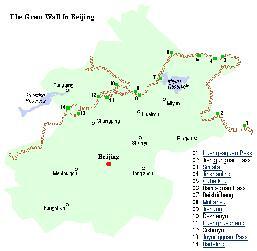 Updated with additional Google powered GPS Map of Great Wall locations ! Ningxia Hui AR, Shizuishan Pref. , Dawukou District. Ningxia Hui AR, Zhongwei Pref. Ningxia Hui AR,, Wuzhong Pref. , Tongxin County. Ningxia Hui AR,, Guyuan Pref. , Guyuan County. After passing through Beijing City Province and Badaling, the Great Wall re-enters Hebei Province at ... after which its heads towards the city of Zhangjiakou a.k.a. "Kalgan" (Mongolian for Heaven's Gate). After passing through Beijing City Province the Great Wall re-enters Hebei Province at Jiminggou after which its heads towards the City of Zhangjiakou a.k.a. "Kalgan" (Mongolian for Heaven's Gate). Full Listing of All Great Wall of China Locations in Beijing. As the Great Wall of China approaches the Capital of Beijing, defenses become more and more elaborate. One of the main features of the Great Wall in Beijing City Province is its multiple layers. Apart from the main visible path traced in this list (and visible on our Satellite Image Map) another defensive ring, the outer layer of the Great Wall exists to the North. As an expression of this multi-layered defensive approach another site can be found someways to the North, within Chengde Prefecture. A section of this wall can be seen when passing by train from Beijing Western Railway station to Chengde, in the past known as Jehol, home of the Imperial Fleeing the Heat Mountain Villa (a Huge "Summer Palace", and the secondary headquarters of the Qing Dynasty (1644 AD - 1911 AD) Family. 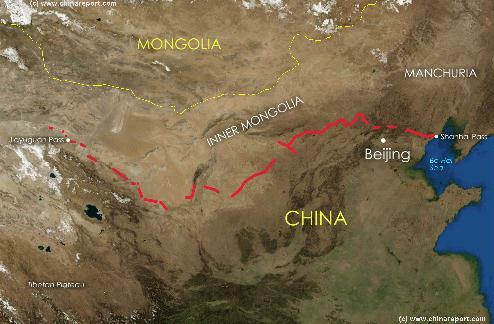 The main visible line of the Great Wall of China continues far south of Chengde City passing from Malanyu in Zunhua County, Tangshan Prefecture of Hebei Province into the very northernmost tip of Tianjin City Province. In this narrow strip of land fit only two sections of the Great Wall of China, one of them originally dating back to the Qi Dynasty Era. This is Yellow Cliff, Huangyaguan. The other Great Wall section in Tianjin is known as Taipingzhai. Tweets about "#Great Wall China"